And the magazine comes with free Metallica beer mats and a giant, double-sided Iron Maiden poster! In 1969, four mates from Birmingham changed their band’s name to Black Sabbath and went about writing the album that would change music forever. So, in the new issue of Metal Hammer, we’re doing something special. Very special indeed, in fact. We’re celebrating 50 Years Of Metal – the bands, the albums and the stories that have defined our world. 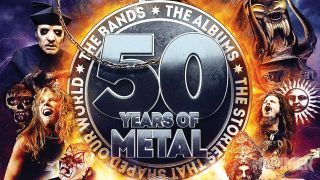 Decade by decade, we bring you the definitive look though fifty years of metal history, from the blueprints set down in ‘69, to its mighty 80s heyday, to the wild and wacky 90s right up to the bands creating history in the scene today. We put together the most metal panel in history and tasked them with picking the 50 greatest albums ever made. Just look at some of the names we got in! Each and every one of them picked an album that helped define metal through the years – and you won’t believe some of their choices. Also in the new issue, we grill Gojira’s Duplantier about that Sea Shepherd EP, dissect the brain of Fever 333’s Jason Aalon Butler, dig into the story behind Alice In Chains’ most personal song, celebrate the genius of A. A. Williams and more. Oh, and the new issue also comes with a free double-sided Iron Maiden poster and free Metallica beer mats. How cool is that? The new issue of Metal Hammer is onsale now. Order your copy here.